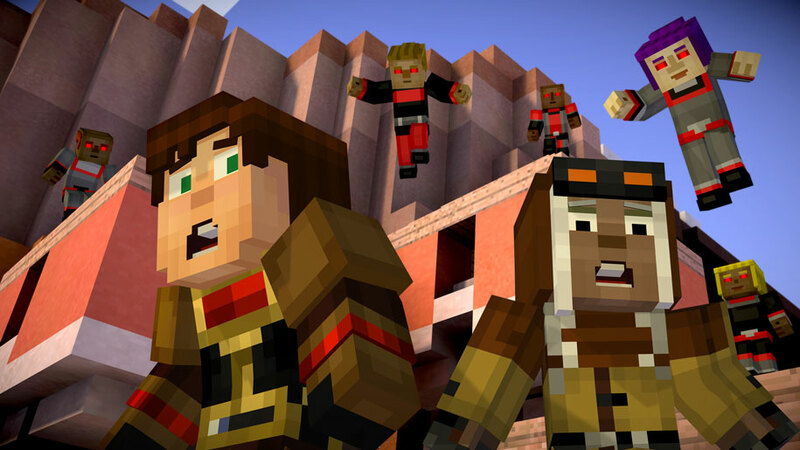 Over the course of Minecraft: Story Mode we have followed the journey of Jesse and his friends as they’ve faced down an apocalyptic event and uncovered the truth behind their former heroes and have since begun to create their own legends. After the last episode through the gang into a murder mystery, this latest episode, ‘Access Denied’ offers something a bit different from what fans of the game will likely be used to. Is this difference worth your time? 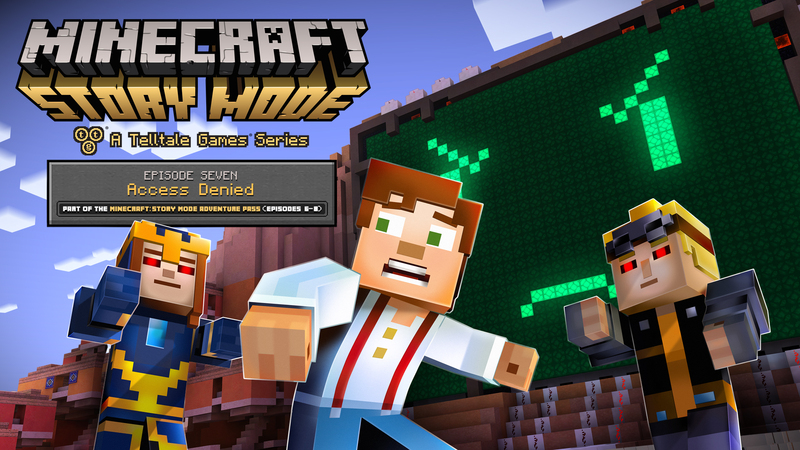 Although Minecraft: Story Mode – Access Denied is an almost entirely self-contained storyline, it still takes place after the events of the major storyline in the series as well as the fifth episode that explains just how Jesse and the group ended up in their current situation. As such it is recommended to avoid reading further if you have yet to complete the most recent episodes. The story this time around begins with Jesse, Ivor, Petra, and Lucas traveling through numerous portals in a montage sequence that sees the group running from different kinds of danger such as a literal fire world, a world that looks like it was filled with sheep, and other strange oddities. While no timeframe is given, it is clear that the group has been attempting to find their way home for quite some time now and frustration is starting to build. After a brief argument about what to do next, the team opt to enter a portal surrounded by Redstone blocks thinking that it might symbolize intelligent people on the other side. The problem is not only does the world they get dropped into appear to be a completely desolate wasteland, but the first thing they encounter is an incredibly strong zombie that can survive in broad daylight. Things begin to grow even stranger when more zombies appear but, after a strange sound reminiscent of the old dial-up tone plays, the zombies begin to lead them to a ghost town. The gang soon learns that a large and power hungry computer named PAMA has managed to enslave all of the residents of the world, including monsters and animals, using redstone chips installed in the back of their heads in an effort to make everyone “useful.” The problem is, the world has reached peak efficiency some time ago and PAMA is looking to extend her skills to other worlds. With a pair of his friends taken hostage and only a mysterious stranger willing to help out, Jesse must take down PAMA in order to prevent the dystopian nightmare from spreading to other lands such as their home world and also save those close to him. 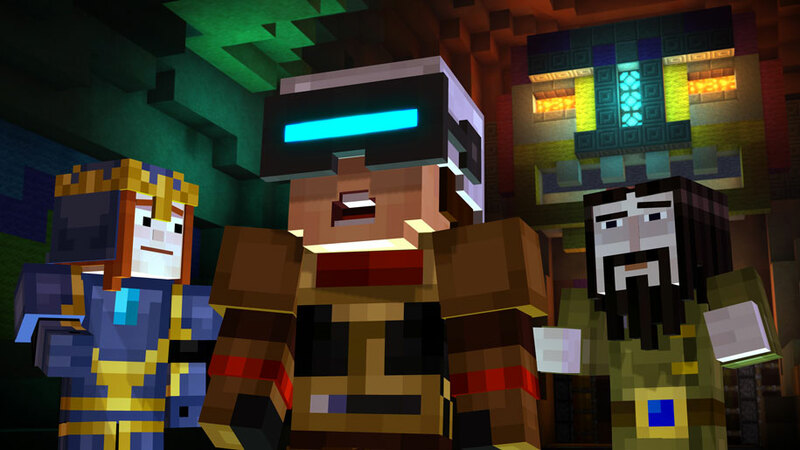 The science fiction setting that is established in Minecraft: Story Mode – Access Denied is a bit by the books as far as they come but that doesn’t mean it isn’t interesting. This is primarily thanks to the interactions with PAMA and how she transitions from simply being curious to menacing at the drop of a hat and is willing to threaten the group in a manner that hasn’t felt as believable sine the Witherstorm. It is worth noting that outside of PAMA, the only other character introduced is one that appears will hang around at least to the end of the series with the next episode as she turns out to be a vital piece to the group returning home as the series comes to its final episode. With PAMA serving as the best character introduced since the core series came to an end and the writers placing plenty of little references in the dialogue sci-fi fans will definitely enjoy this element of the episode while those who aren’t fans will still appreciate the fresh take on the world and what PAMA is attempting to do, though don’t expect many lingering effects from her as the episode comes to an end. That being said, the ever persistent nature of the lack of meaningful choices rears its head again in this episode along with the extremely limited run time. Even when examining everything and talking to everyone possible the episode clocks in at only a little over an hour in length and throughout this time even the biggest choices of the episode end up meaning nothing by the time the credits roll. Whether the various choices you make will play a role in how characters like you at the end of everything is yet to be seen but one that could have either been devastating in nature by causing a death or permanent rift in the group is smoothed over like it never happened. This seventh episode in the series treads the same ground as players are used to traveling in these games as far as gameplay is concerned. There are a few areas where players will explore an area and examine things with one extremely simplistic puzzle being placed in one such location while the rest of the episode involves various dialogue choices and quick time event action sequences. The action sequences this time around are far more plentiful than they were before and thanks to the use of a certain headset in the game players are treated to a unique situation that is only capable thanks to the more scientific nature of the world the gang is in. 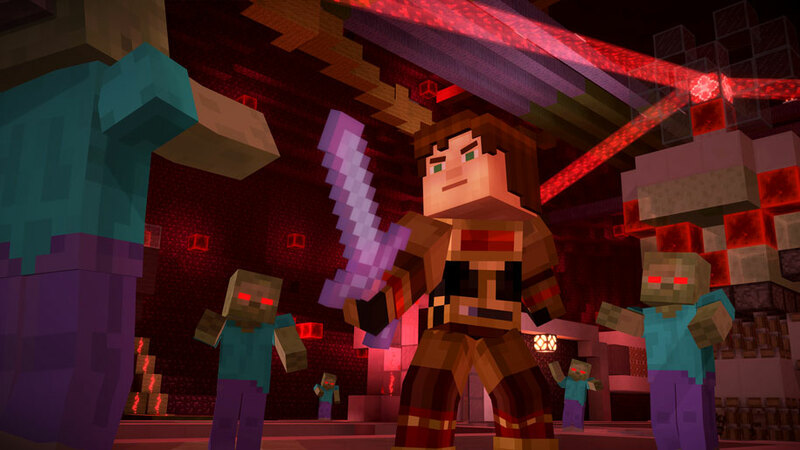 With Minecraft: Story Mode – Access Denied only introducing a pair of characters and being set in a mostly desert world, it is disappointing to see that outside of one area at the end of the episode most of the environments players will be seeing are incredibly bland for a game that can be customized so heavily such as this one. There is a nice highlight however when it comes to PAMA and the fact that she is displayed using a very basic display with emotes displaying her emotions. As mentioned, the pair of characters introduced are voiced well enough, with PAMA given a fitting digital filtered voice, while all of the core cast continues to fit their roles well in this series. 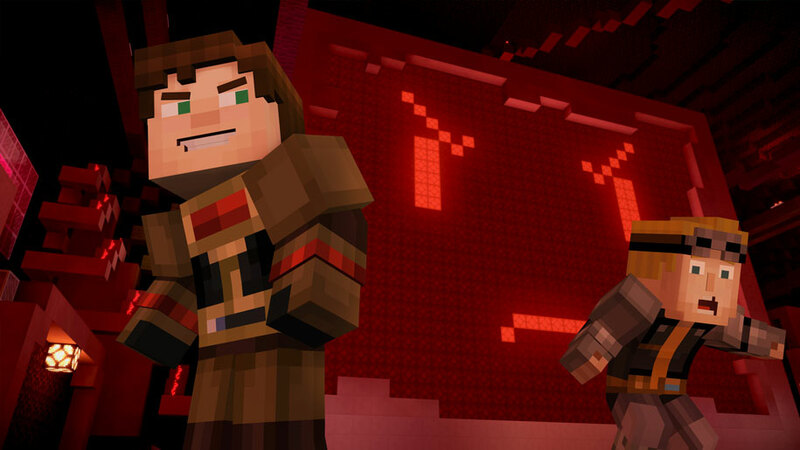 Despite the fact that Minecraft: Story Mode – Access Denied continues to display the fact that the choices made by the player have no real influence on interactions and is once again incredibly short in nature, it also serves as one of the best episodes of the series since the defeat of the Witherstorm. Thanks to witty writing, machinations of PAMA, and the player’s interactions with her this episode turns out to be rather surprising at times and serves as a solid continuation to the next, unless its extended once more, and the final episode. 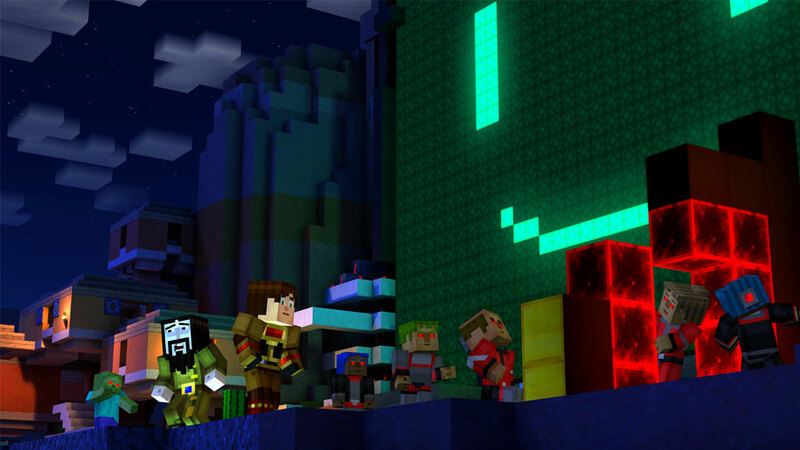 Minecraft: Story Mode – Access Denied may not be long or give players much control but delivers a solid storyline with a splendidly written antagonist that actually feels like a threat for the first time in a while.